← Help us fill the frame… by walking to Alderwasley! I was presuming it stored cotton. Actually when it arrived had a few pins, needles and press studs inside it although some are new. It was probably used as sewing box by the previous owner. Any more thoughts gratefully accepted. Hi Matt, That seems more like it, although later I thought maybe it was a salesman’s sample box – maybe they put small swatches of cotton fabric in it to demonstrate the different weaves, or patterns? It *would* be an excellent sewing notions box. I’d buy one! I was a sub-agent for Walter Evans in the 1960s supplying factories making singlets which was a huge business in Australia. I believe the box would have held a range of colours in machine cotton probably for the domestic market although I never saw such a box. Thansk for the infomation Peter! I have this morning bought in a charity shop a handsome small wooden box. It is in the shape of a chessman, in dark turned wood about 3″ high with a finial on the lid. 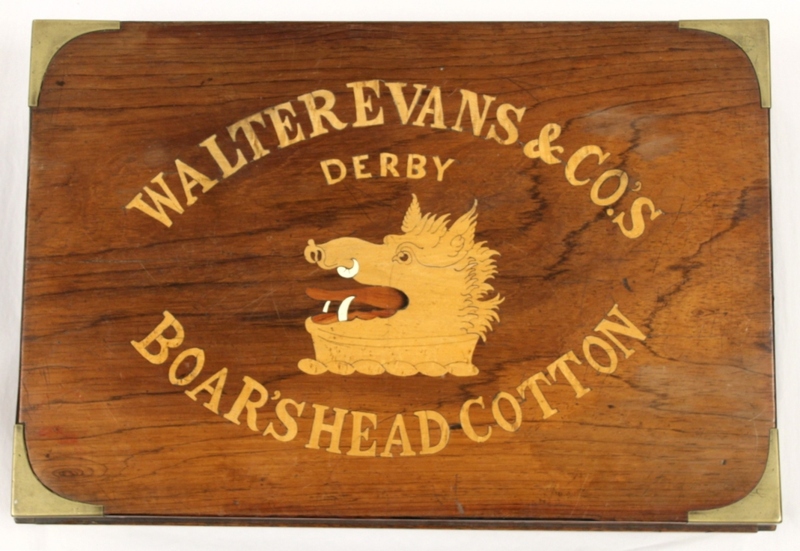 The label underneath (which is like the label from a traditional bobbin of cotton) says: WALTER EVANS & Co. DERBY – 10 MALTESE THREAD. I had assumed it was a rather posh container for a bobbin of special quality cotton thread, but your website intimates that Walter Evans manufactured cloth. I would be very pleased if anyone could tell me more about this little treen box. Walter Evans created many cotton threads, as evidenced in numerous mid-late 19th century crochet pattern books calling for their Boar’s Head cotton in making their articles. Maltese crochet was a type of crochet that used a loom, now more commonly referred to as a hairpin lace loom. 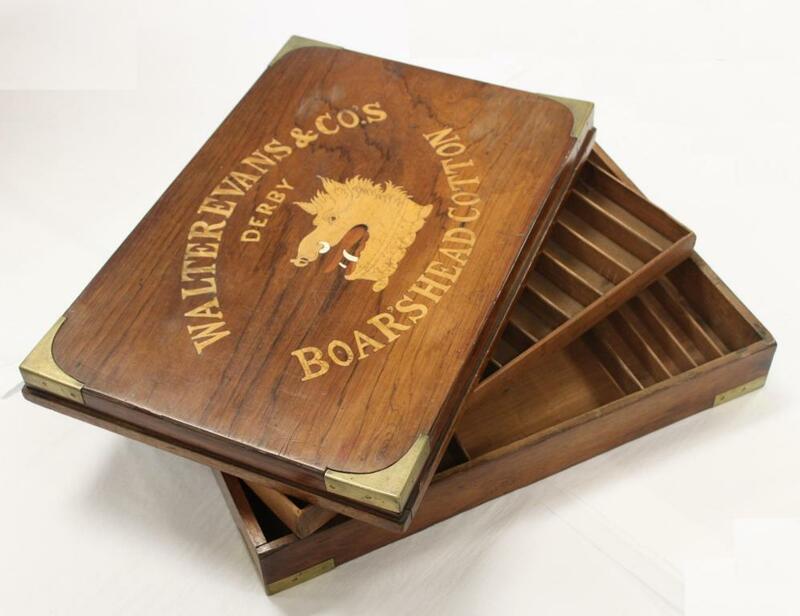 I suspect the large box pictured above was used by salesmen to show off various samples of the types of threads Walter Evans sold.